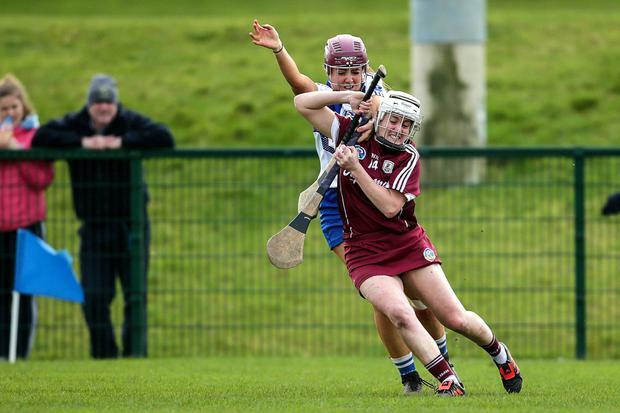 Ailish O'Reilly hit a goal and three points while Carrie Dolan slotted eight points from placed balls as Galway assured themselves of a place in the Littlewoods Ireland Camogie League Division 1 semi-finals when getting the better of Waterford by 1-14 to 1-6 at Carriganore. All that is to be determined in Group 2 now is who will advance as top seeds, with Cathal Murray's troops playing host next weekend to All-Ireland champions Cork, who also boast a 100pc record from three rounds. The same applies in Group 1, with a 5-18 to 1-10 victory for Kilkenny over Offaly at St Rynagh's and a 1-16 to 1-12 triumph for Limerick over Dublin at Parnells leaving both with unblemished records ahead of their clash next Sunday. Beth Carton hit all six of Waterford's points against Galway, while young substitute Kaiesha Tobin's goal will take some bettering in terms of team play. But the home side did not do enough with the wind in the first half and they were punished severely for defensive indiscipline by Dolan. Noreen Coen's brilliant opening point in the second minute did not signal any scoring rush, though she was to finish with three herself, and it was another 10 minutes before O'Reilly added to the visitors' tally. Carton hauled Waterford back in to the fray with three well-struck frees and when Tobin palmed the All-Star's perfectly-judged pass to the net shortly before half-time, the teams were level. Dolan was given another opportunity from a free however, and Galway led by 0-8 to 1-4 at the break. Waterford could only manage two points into the wind after the resumption however, as Dolan, Coen and O'Reilly helped stretch the margin to four by the time O'Reilly gathered a Starr delivery, turned sharply and rifled a shot to the net in the 42nd minute There was no way back for Waterford from there. In the other Group 2 tie, Tipperary manager Bill Mullaney pitched in four of last year's minors for their first starts and he will have been delighted with how they fared as the Premier left St Patrick's Park with their first win of the campaign, by 5-11 to 0-8 over Wexford. Wexford must now face a relegation play-off, where Offaly or Dublin will provide the opposition. Though failing to make the knockout stages in the championship, Limerick have been regulars in the penultimate stages of the league and they have made it for the fourth successive year. Niamh Mulcahy struck nine points for the Shannonsiders but the spread of scorers was notable with Caoimhe Costelloe, Rebecca Delee and Caoimhe Lyons carrying on their form of the past few weeks.